Born in Dongping, Shandong province in 1951, Zhang Qingli joined the CPC in 1973 after graduating from the Party School of the CPC Shandong Provincial Committee. From 2006 to 2011 he served as Secretary of the CPC Tibet Autonomous Regional Committee. He did not endear the Tibetans when he accused the Dalai Lama of being ‘a wolf in monk’s garb’. Speculations about Zhang’s future were mainly due to the fact that his term had come to an end in Tibet. He was soon after transferred to Hebei province as Party Chief. In November 2012, he was elected a member of the 18th CPC Central Committee. On March 11, 2013, Zhang Qingli became secretary-general of the 12th National Committee of the Chinese People's Political Consultative Conference (CPPCC). He will now assist Yu Zhengsheng in United Front affairs. This is bad news for the Tibetans. Du is also a member of the powerful Secretariat of the Central Committee. In this position he can monitor the party and state’s United Front apparatus. Why not a Water Treaty with China? The Press Trust of India (PTI) reported that Prime Minister Manmohan Singh has asked the Chinese President Xi Jinping to set up a joint mechanism with India to assess the construction work on dams on Brahmaputra river in Tibet. PTI wrote: "Notwithstanding pledges to take the bilateral relationship to a new level, Prime Minister Manmohan Singh in his first meeting with new Chinese President Xi Jinping has sought a joint mechanism to assess the construction work on dams on Brahmaputra river in Tibet." The Prime Minister told journalists traveling with him in the plane : "I took the opportunity to raise the issue of trans-border river systems. I requested the Chinese government to provide a joint mechanism to enable us to assess the type of construction activity that is going on in the Tibetan Autonomous Region (TAR)." Apparently, President Xi assured Dr. Singh that China was quite conscious of its responsibilities and 'the interest of the lower riparian countries'. PTI added: "As regards the specific mechanism that he had asked, the Chinese President told him that they would further look into it." One could ask, why just a 'joint mechanism' and not a Treaty in the lines of the Indus Waters Treaty signed in 1960 with Pakistan. And what about the Sutlej and the Indus? The Prime Minister justified his shyness: "But as of now, our assessment is that whatever activity that is taking place on the Brahmaputra region in Tibet, it is essentially run-of-the-river projects and therefore there is no cause of worry on our part." The only solution lies in bringing the matter to the negotiating table and reach a bilateral (or multilateral) water agreement. If a river-water Treaty could be signed between India and Pakistan, why can not a similar agreement be made between China, India, Bhutan and Bangladesh, in order to assure a decent life for all in the region? Further there is Convention on the Law of the Non-Navigational Uses of International Watercourses adopted by the UN in 1997 (though not yet an international law, because not ratified by enough nations). It could serve as a model for bilateral or multilateral treaties/conventions with China. The fruition of the projected mega-projects will entirely depend on the new leadership in China. If he is wise, Xi Jinping will take into account a conflict with the neighbours in calculating the cost-benefits of these mega-projects. A formal agreement/treaty whether in line with the 1997 UN Water Convention or any other formal agreement is the only solution which can give guarantees to the lower riparian States. I will not comment on India 'opposing' the Tibetan activities in India. India opposes "Tibetans to conduct political activities against China"
Indian Prime Minister Manmohan Singh said Wednesday that his country recognizes the Tibet Autonomous Region is a part of the Chinese territory and that India will not allow Tibetans to conduct political activities against China in India. 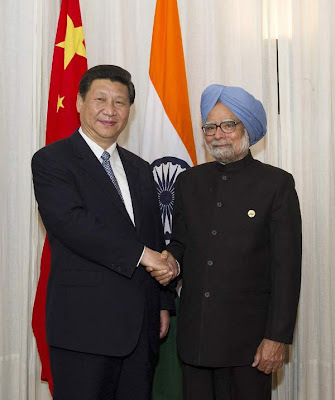 Manmohan Singh made the remarks during meeting with Chinese President Xi Jinping on the sidelines of a summit of BRICS countries -- Brazil, Russia, India, China and South Africa -- in the South African port city of Durban on March 27th. The Indian prime minister said his country, which adheres to an independent foreign policy, will not be used as a tool to contain China, adding that India is willing to make concerted efforts with China to show the world that they are cooperative partners instead of rivals. India will abide by political guidelines set by both sides and seek a solution to the bilateral border issue from a strategic height with a commitment to safeguard peace in their border areas, he said. He also voiced the hope that the two countries would respect each other's core interests and major concerns, deepen mutual strategic trust, strengthen coordination and cooperation on international affairs, and safeguard peace and stability in the region and the world at large. In the China Brief, Willy Lam speaks of "another significant phenomenon in the recent spate of personnel changes is the rise of the influence of the so-called Tibet Faction, a reference to cadres who have served in senior positions in the restive region." As I mentioned earlier on this blog, several members of the Politburo and the government have been posted in Tibet in the past. This does not stop or even slow down the repression on the Tibetan plateau. Radio Free Asia (RFA) reported that the Chinese authorities are circulating a list of 13 'unlawful' behaviors in China’s northwestern Qinghai province. The Tibetans are warned against any involvement in self-immolation protests and a range of other activities which could challenge the Chinese rule. RFA says: "An undated document listing the restricted behaviors, including filming self-immolation protests and seeking welfare donations, has been disseminated in all towns and villages of Rebgong county in Qinghai’s Malho Tibetan Autonomous Prefecture". Activities forbidden include fund-raising 'in the name of social welfare'; urging protection of the environment or the Tibetan language; conducting prayer rituals or other religious ceremonies if these carry 'overtones' of support for Tibetan independence; intimidating government officials; inciting self-immolation protests; obstructing the 'rescue' of self-immolators by Chinese security forces and sending images or information about self-immolations to 'outside separatist forces'. The list particularly bars Tibetans from 'taking pictures and filming the actual scene of self-immolation and mass gatherings' and 'providing secret information to separatist forces'. Let us hope that Yu Zhengsheng and his colleagues will soon realize that other methods may be more efficient than constant repression to diffuse the situation. Why can't he listen to the Tibetans? It is what Hu Yaobang did in May 1980 when he visited Tibet. It immediately had salutary effects. President Xi Discussing the "China Dream"
Immediately after Xi Jinping was elected state president at the just-ended First Session of the 12th National People’s Congress (NPC), he revisited his idea about fulfilling the “China dream.” Xi, who is also general secretary of the Chinese Communist Party (CCP) and commander-in-chief, cited three prerequisites for bringing about the “renaissance of the Chinese race:” following the “Chinese road,” “developing the China spirit” and “concentrating and crystallizing China’s strength” (Xinhua, March 17). The last imperative about the concentration of powers has been reflected by the fact that a number of key party and state organs have been strengthened considerably. As Xi has reiterated since the 18th Party Congress last November, a crucial challenge of the new leadership is that it must “ensure that [Beijing’s] policies and directives are smoothly followed” by the entire nation (CNTV.cn, February 6; China.com.cn, January 8). 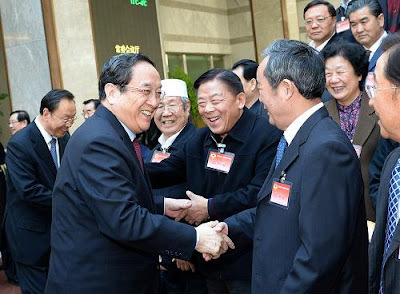 Within the CCP’s higher echelons, more power has been given the party’s Secretariat, which is the “work organ” of the supreme seven-member Politburo Standing Committee (PBSC) (People’s Daily, June 1, 2011). The Secretariat under Xi consists of seven members—one more than that of the previous Hu Jintao administration. For the first time in party history, the State Council secretary general has been inducted into the CCP Secretariat. This means that Yang Jing (age 59), who was appointed to this post at the NPC, has to report to both Premier Li Keqiang and Liu Yunshan, who is the PBSC member in charge of the Secretariat. Since the office of the State Council secretary general is considered the nerve center of the entire central government, both Liu and Xi—who exercises overall control over party affairs—can exert substantial influence on the operations of the government (Ta Kung Pao [Hong Kong]; March 17; Sina.com [Beijing], March 17) . Moreover, the ranking and authority of individual Secretariat members have been elevated. For example, Li Zhanshu concurrently serves as director of the Central Committee’s General Office. Li, who is Xi’s premier troubleshooter, was inducted into the Politburo last November. By contrast, Li’s predecessors, who include Wen Jiabao, Zeng Qinghong, Wang Gang and Ling Jihua, were merely Central Committee members when they were occupying that post (Sina.com, March 24; Ta Kung Pao, November 15, 2012). Apart from Liu Yunshan, Li and Yang, other members of the Secretariat are in charge of hefty portfolios that embrace most of party and government procedures. Liu Qibao (age 60), a Politburo member who doubles as director of the party’s Propaganda Department, handles issues ranging from ideology to propaganda. Politburo member Zhao Leji (age 56), who is also director of the Organization Department, looks after personnel issues affecting not only party and government positions but also senior slots in state-owned enterprises (SOEs). Du Qinglin (age 66), who doubles as vice chairman of the Chinese People’s Political Consultative Conference (CPPCC), runs the party and state’s united front apparatus. Finally, Zhao Hongzhu (age 65), who is executive vice secretary of the Central Discipline Inspection Commission (CDIC), is in charge of China’s highest-level anti-corruption agency (Beijing News, March 17; People’s Daily, March 12). The fact that Li, Zhao Leji and Zhao Hongzhu are deemed Xi protégés testifies to the fact that compared to the initial phases of the tenures of predecessors Jiang Zemin and Hu Jintao, Xi has been more successful in consolidating his power base ( “All the General Secretary’s Men: Xi Jinping’s Inner Circle Revealed,” China Brief, February 15). In his first international press conference at the end of the NPC, Premier Li pointed out that his team will focus on “simplifying administrative [measures] and devolving powers to the regions.” He said “We must change the nature of the government’s function...Whatever can be done by society should be handled by society” (CCTV News, March 17; China News Service, March 17). The much-anticipated program of streamlining State Council departments, however, has proven to be a disappointment. Only two of the central government’s 27 commissions and ministries have been slashed. ( “National People’s Congress Marks Sharp Turn Toward Conservatism,” China Brief, March 16). More significant is the fact that two major units of the State Council have assumed unprecedented clout. The first is the National Development and Reform Commission, which is often nicknamed the “Miniature State Council,” because it is entrusted with the task of “macro-level adjustment and control” (hongguan tiaokong) for most aspects of the economy. The post-NPC lineup of the NDRC leadership comprises four full Central Committee members: new NDRC Minister Xu Shaoshi (age 61), Executive Vice Minister Jie Zhenhua (age 63) and two newly-appointed vice ministers, Liu He (age 61) and Wu Xinxiong (age 63). By contrast, there is only one Central Committee member—usually the minister—in most ministerial-level units of the State Council. Under Premier Li, the NDRC has been given additional responsibilities, including overseeing the electricity-generation sector and engaging in long-time planning regarding population growth and urbanization (China Review News [Hong Kong] March 20; China News Service, March 13). Given the top priority that the Xi-Li administration has given to preserving stability (weiwen), it is perhaps not surprising that the power of the Ministry of Public Security, or police, has been enhanced. The post-18th Party Congress MPS boasts three full members of the Central Committee. Apart from State Councilor and Minister Guo Shengkun (age 58), both Executive Vice Minister Yang Huanning (age 55) and Vice Minister Li Dongsheng (age 57) are Central Committee members. Like his predecessor Meng Jianzhu, who was last November promoted Politburo member and Secretary of the Central Political-Legal Commission (CPLC), Kuo is not a career policeman. A former head of SOEs in the metallurgical sector, Guo was party secretary of Guangxi Province when he was named the nation’s top cop last December. Li Dongsheng, who had an illustrious career in state television and the CCP Propaganda Department, was appointed MPS vice minister in 2009. By contrast, Yang, who holds a doctorate in criminal law from Peking University, is a veteran police officer who specializes in detective work (CNTV.cn, March 7; Sina.com, March 4). That the police apparatus has gained more clout and responsibilities may have to do with the fact that President Xi is the PBSC member with direct oversight over the political-legal (zhengfa) hierarchy (Liberty Times [Taipei], February 3; Ming Pao [Hong Kong] January 31). Moreover, a number of cadres with experience in police and zhengfa work have been promoted in a post-NPC regional reshuffle that has affected up to 10 provinces. For example, CPLC Secretary General Zhou Benshun (age 60), a former police chief of Hunan Province, was appointed party secretary of Hebei Province. Wei Qiang (age 60), a former head of the political-legal department of the Beijing municipal party committee, was named party secretary of Jiangxi. In the same vein, Du Jiahao (age 57), a former zhengfa secretary of Heilongjiang Province, became deputy party secretary and governor-designate of Hunan Province. Finally, Hao Peng (age 58), the former political-legal boss and deputy party secretary of Tibet, became deputy party secretary and governor-designate of Qinghai Province (People’s Daily Online, March 21; China News Service, March 21; Xinhua, March 20). Yet another significant phenomenon in the recent spate of personnel changes is the rise of the influence of the so-called Tibet Faction, a reference to cadres who have served in senior positions in the restive region. Two veterans of the Tibet Autonomous Region (TAR), Guo Jinlong (age 65) and Hu Chunhua (age 49) were inducted into the Politburo at the 18th Party Congress. A former Tibet party secretary, Guo was appointed Beijing party secretary last year. Hu, a former Tibet deputy party secretary, was named Guangdong party secretary last November. At the just-finished CPPCC plenary session held in March, Zhang Qingli (age 62), who was Tibet party boss from 2005 to 2011, was promoted to vice chairman and secretary-general of the CPPCC, a united-front organ. Yang Chuantang (age 58), another former Tibet party secretary, became minister of the expanded Ministry of Transport at this NPC. Moreover, former-TAR Vice Chairman Qin Yizhi (age 47) recently was named first secretary of the Communist Youth League. A key factor behind the fast-track promotion of these cadres seems to be that their Tibet experience has testified to their ability to implement Beijing’s directives under extremely tough conditions (China.com, March 19; People’s Daily, March 15; Ifeng.com [Beijing], March 13). Structural changes in the party-state apparatus as well as personnel movements the past several months have demonstrated the premium that the Xi-Li leadership has put on concentration of powers as well as upholding socio-political stability. These developments also mark a departure from the dictums of late patriarch Deng Xiaoping about the devolution of powers and in particular, the separation of party and government, which was written into the Political Report to the 13th Party Congress of 1987. President Xi, however, obviously favors a different approach to governance. As Zhang Ping, the just-retired NDRC minister, put it during the NPC session, “China’s best advantage is that [the authorities] can concentrate the nation’s resources and efforts to do big things” (People’s Daily Online, March 6; Sohu.com [Beijing], March 6). For President Xi, it is apparent that the Leninist doctrine of “democratic centralism” is the best way of realizing the China dream. Before the 2008 Beijing Olympics, Ji Lin was chairman of Chinese capital top advisory body, the Beijing Committee of the Chinese People's Political Consultative Conference. He now says that the Chinese capital is today doing far more than it did few years ago to ensure that Beijingers enjoy a blue sky. Ji affirmed: "We went all out to improve the environment and had 'truly exceptional Games' in 2008, ...now we are addressing air pollution on a larger scale and with more investment than was possible when we prepared for the Games." But with little results.The China Daily wrote: "In addition to capping coal consumption in Beijing, the city is seeking to get neighboring Tianjin, Hebei and Shanxi to rally behind the fight against pollution." However a Chinese ministry report shows smog caused 1.1 trillion yuan (about 180 billion US $) in losses in 2010, though the study does not include damage to people's health and deaths. The South China Morning Post also writes on the hot topic: "The mainland is paying an increasingly heavy price for rampant pollution, with direct economic losses more than doubling between 2004 and 2010, a recent government-backed study has found." An estimate prepared by the Netherlands Environmental Assessment Agency (MNP), using published BP (British Petroleum) energy data and cement production data believed that during the the 1990-2006 period, global fossil-fuel related CO2 emissions increased over 35%. It says: "In 2006 global CO2 emissions from fossil fuel use increased by about 2.6%, which is less than the 3.3% increase in 2005. The 2.6% increase is mainly due to a 4.5% increase in global coal consumption, of which China contributed more than two-third. China’s 2006 CO2 emissions surpassed those of the USA by 8%. This includes CO2 emissions from industrial processes (cement production). With this, China tops the list of CO2 emitting countries for the first time. In 2005, CO2 emissions of China were still 2% below those of the USA." 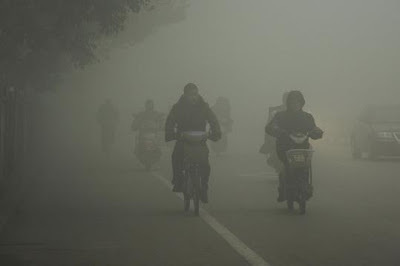 Today according to the data collected by the United States Department of Energy's Carbon Dioxide Information Analysis Center (CDIAC) for the United Nations, China has produced 23.5% of the world CO2 in 2012; the USA comes second with 18.27%, the EU third with 13.98% and India, fourth with 'only' 5.83%. Another interesting study has been published in China. It affirms that "about 90 per cent of glaciers in Tibet called the Third Pole region are shrinking because of black carbon pollution 'transferred from South Asia' to the Tibetan Plateau". Yao Tandong, director of the Chinese Academy of Sciences' Institute of Tibetan Plateau Research claims that the ongoing research over more than 30 years has given scientists a better understanding of pollution on the Tibetan Plateau. According to him, black carbon generated from industrial production in South Asia is being taken to the Tibetan Plateau by the Indian monsoon in spring and summer. The China Daily quoted him saying: "The accumulation of black carbon on the plateau will accelerate the shrinking of glaciers, bringing with it persistent organic pollutants that will be deposited in the soil". The investigation using topographic maps and satellite images revealed the retreat of 82 glaciers, area reduction by 7,090 glaciers and the mass-balance change of 15 glaciers, and for Yao: "Systematic differences in glacier status are apparent from region to region, with the most pronounced shrinkage in the Himalayas, the south eastern part of the region. Some of the glaciers there are very likely to disappear by 2030 ...The shrinkage generally decreases from the Himalayas to the continental interior and is smallest in the western part. Some glaciers there are even growing." Whether is assessment is correct or not will have to be checked by Indian scientists. The fact remains that China has huge problems in its metropolises. It is high time to start calculating the true growth of a country which should include 'green' parameters and the damage caused to environment. We will then discover that old Europe is perhaps not in such a bad shape. The mainland is paying an increasingly heavy price for rampant pollution, with direct economic losses more than doubling between 2004 and 2010, a recent government-backed study has found. An incomplete calculation of the environmental costs in 2010 showed that pollution had caused 1.1 trillion yuan (HK$1.36 trillion) in economic losses, or 2.15 times the 511.8 billion yuan loss in 2004, when the "green GDP" project was launched. The direct cost of pollution accounted for 2.5 per cent of total economic output in 2010, but if damage to the ecosystem - including forests, wetlands and grasslands - was included, the losses added up to 1.54 trillion yuan, or 3.5 per cent of that year's gross domestic product. The cost of pollution also grew more rapidly than GDP in 2010, up 13.7 per cent compared with GDP growth of 10.4 per cent. The latest update of the study, led by the Ministry of Environmental Protection's Chinese Academy of Environmental Planning, was quietly posted on the academy's website in January, when about a seventh of the mainland was shrouded in smog. It said the findings were incomplete due to lack of data in some areas. Aimed at putting a price tag on the mainland's runaway economic growth, the study has been stubbornly resisted by local governments because the findings could tarnish their political achievements. As a result, the academy had only previously released figures for 2004 and 2008, even though the study is conducted annually. "The existing accounting system fails to reflect the true cost of resources consumption and environmental degradation, as a result the country's economic achievement has been over exaggerated," the academy said in a summary of the findings for 2010 that was posted on its website. Government campaigns targeting major air and water pollutants since 2006 were not able to reverse the trend of rising environmental costs, it said. 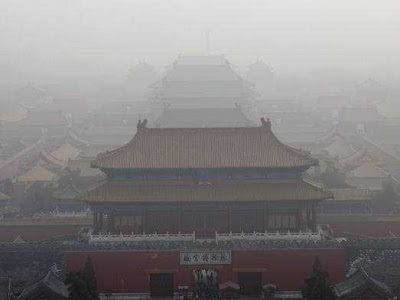 A total of 558.9 billion yuan would have been needed to clean up pollution in 2010, an increase of 94 per cent from the 287.4 billion yuan needed in 2004, the study said. The research does not calculate the health costs associated with pollution, but they would push the economic losses even higher. A government-sponsored report released in 2006 said air pollution caused 358,000 premature deaths in 600 mainland cities each year, with an estimated health cost of 152.7 billion yuan. The World Bank estimated in 2007 that the health costs of air and water pollution equalled 4.3 per cent of the mainland's GDP. Premier Li Keqiang has pledged that the country will not pursue economic growth at the expense of the environment, saying "such growth won't satisfy the people", but has yet to release details of his planned remedy. Professor Li Wei, from Beijing Normal University, said the "green GDP" project's findings should serve as a wake-up call for local governments and officials, and prompt them to reconsider their economic growth targets. China Environmental News, the ministry's daily, said on Tuesday that the project might have regained momentum. Why do Chinese leaders love Tibet so much? Perhaps because a posting on the Roof of the World seems to bring Communist officials ‘good luck’ in their career. The latest senior cadre to experience this is the 47-year-old Qin Yizhi who served as a vice-chairman of Tibet's regional government. He has just been appointed as the head of the Communist Youth League, “a training ground for future party and government officials with nearly 80 million members” as the South China Morning Post (SCMP) put it. Guangdong party secretary Hu Chunhua, often considered as the future leader of China in 2022, had earlier followed the same trajectory: first vice-chairman of Tibet's regional government in 2003 and then Youth League boss in 2006. Hu (not a relative of former President Hu Jintao) is now a member of the all-powerful Politburo of the Chinese Communist Party (CCP). Qin had taken his job in Lhasa in 2005 as Lhasa Party Chief; he later became vice-chairman of the Tibetan government. Qin has an illustrious predecessor. In September 1987, Lhasa witnessed a series of large-scale riots. As the Chinese leadership felt they were losing face in the world's eyes, Beijing became more and more nervous. The monks, the very same people who were supposed to have been 'liberated' from the clutches of the high clergy, were now revolting against the 'motherland.' Beijing reasoned that if the situation were allowed to drift, China could follow the Soviet Union on the way to disintegration; something had to be done. The strong men in the Politburo, Li Peng and Qiao Shi, visited Tibet in July 1988. Soon after, it was decided to appoint the young cadre, Hu Jintao as Tibet’s Party chief. It was to be the crucial turn in Hu's career. He probably knew he had to show results in a very short time to repay the confidence placed in him by the senior leaders; he could not afford to fail. Hu took charge of the rebellious region on January 12, 1989. On January 23, Hu visited the Tashilhunpo monastery in Shigatse. He was accompanied by the Panchen Lama, the second highest ranking Tibetan Lama after the Dalai Lama. The official occasion was the consecration of a stupa containing the mortal remains of one of the previous Panchen Lamas. To everyone's surprise, during the function, the Panchen Lama denounced the Communist Party's role in Tibet. He said: “although there had been developments in Tibet since its liberation, this development had cost more dearly than its achievements. This mistake must never be repeated.” Four days later, he passed away in mysterious circumstances. Though it has never been proven, many Tibetans believed that he was murdered. When a demonstration erupted on March 5, the People's Armed Police quickly took control of the situation; it was there that the future President of China showed his skills. Some information which filtered out Tibet affirmed that on March 6 alone, 387 Tibetans were massacred around the Central Cathedral in Lhasa. Martial law was clamped on March 8. The tragic 1988 events in Lhasa seem to have been a rehearsal for an even more important episode: the student rebellion on Tiananmen Square three months later. In Beijing’s eyes, Hu saved Chin, which could have plunged into the 'chaos' so feared by the Chinese emperors. Had Tibet been lost, no doubt other provinces such as Xinjiang and Inner Mongolia would have followed in quick succession. Today at least 10 out of 25-member Politburo (PB) are, or have been connected with Tibet, in one way or another. Just to give a few examples. President Xi Jinping is connected through his father Xi Zhongxun who was one of the senior officials ‘in charge’ of the Tibetan affairs the 1950s and later the 80s. One of the two lady-members, Liu Yandong has been associated with the United Front Work Department which looks after Tibet; she headed the organization between 2002 and 2007. Yu Zhengsheng, no 4 in the hierarchy, will soon be nominated Chairman of Central Working Coordination Small Group on Tibet, overlooking the restive region’s affairs. I have already mentioned Hu Chunhua, the Party’s rising star. Another PB member is Liu Qibao; he was Party Secretary of Sichuan province, responsible for large areas of Tibet (2008-2012), also a hardliner. Guo Jinlong has been posted as Secretary of Tibet Autonomous Regional Committee from 2000 to 2004. He was pivotal in the Lhasa Railway project. The list is long and though not in the Top 25, Zhang Qingli, the Party boss in Lhasa till 2011, who called the Dalai Lama a ‘wolf in monk’s garb’, has now been promoted to the prestigious post of Secretary General of the Chinese People’s Consultative Conference. 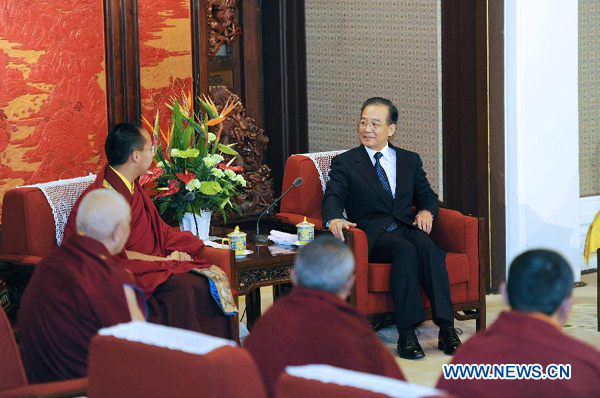 He will be the main advisor of Yu Zhengsheng for Tibet issues. The ‘good luck’ of the high Chinese officials is not that providential for the Tibetans as most of these leaders took a harsh stance while posted on the Roof of the World. One can doubt that so many knowledgeable cooks, even if they are experts on steaming momos, can translate a ‘cool’ policy for Tibet. A couple of weeks ago, the news flashed that the rotting bodies of some 2,000 pigs had been found in a river that supplies tap water to Shanghai. A few days later, the tally had gone to 3,000, then 6,000 and now it has been reported that 13,000 hogs would have been thrown in the river. Let us remember that pork is a staple meat in China and its swine population is the world's largest with 475 million heads. This year, the National People’s Congress (NPC), the Chinese parliament followed the great Communist tradition of ‘voting’ to elect its new leaders for the next 5 or 10 years, with most of the new team receiving 99 % or more of the votes of the 3000-odd NPC delegates. However, one issue triggered countless comments from the Chinese netizens: though 2,952 delegates voted ‘yes’ in favour of Xi Jinping becoming China's new president, there was a lone ‘no’ vote. It attracted a lot of attention on Sina Weibo, China's Twitter, as bloggers remembered that in 1949, Zhang Dongsun, a philosopher and former CPPCC delegate, had voted against Mao. He was later killed for his alleged incorrect behavour. Hopefully it will not happen this time around as times have changed in the Kingdom. However many observers have noted the results of the vote for the NPC's Environmental Protection and Resources Conservation Committee; the new Committee had some 850 negative votes and 125 abstentions, a third of the total votes; this needs to be entered in China’s Guinness Book of Records. Most of the almost 3,000 NPC deputies greeted the result with a long boo, before clapping as the decision was approved. Environment Minister Zhou Shengxian won the least recognition from delegates, receiving 2,734 ‘yes’, the lowest among 25 ministers. A day later, the new Chinese Premier Li Keqiang pledged that his government would "show even greater resolve" in tackling the pollution issue. These are strong words in the mouth of a Chinese Premier, but the situation is bad indeed. The Washington Post correspondent, Debra Bruno described Beijing thus: “I woke up in my dark bedroom the other day, head pounding and mouth dry. Before I even got out of bed, I knew that Beijing was having one of its hazardous-air-quality days. …On a similar day a few days before, I’d walked only 10 minutes from my apartment to my friend’s place. By the time I got there, my coat, scarf and hair smelled the way they would have smelled after a night in a smoky bar followed by a couple of hours standing behind a car’s exhaust pipe.” Can you believe it? Radio Free Asia asserted that toxic chemicals have been found in the ‘pea-soup’ smogs hanging over Beijing, Tianjin and surrounding areas. The Chinese Academy of Sciences (CAS) admitted that large amounts of organic nitrogen compounds were detected in Beijing smog in January. 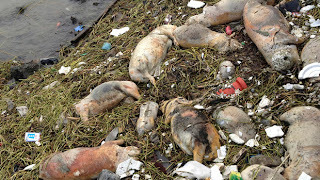 But it is not only air and pigs; the issue is compounded by Government policies. China’s State Council (Cabinet) recently published the blueprint for the nations’ energy sector for the years 2011-15. An eight-year old ban on five megadams on the Nu River (also known as Salween) was lifted, totally ignoring environmentalists’ concerns about geologic and seismic hazards, loss of biodiversity, hazardous resettlement, as well as serious impacts on downstream nations. Katy Yan, China Program Coordinator for the environmental NGO International Rivers stated: “China's plans to go ahead with dams on the Nu, as well as similar projects on the Upper Yangtze and Mekong, shows a complete disregard of well-documented seismic hazards, ecological and social risks”. When in 2003 13 dams on the Salween were first planned, then Premier Wen Jiabao, a geologist by profession, put his foot down and stopped the work. Now, the dam lobbies, particularly the Huadian Corporation have managed to convince the State Council to agree to proceed with the projects; particularly the Songta Dam, the highest upstream dam in the cascade located in Tibet which is to be completed during the 2011-15 period. The most ironical part is that the river is supposedly protected by UNESCO. Defenders of ‘development-first’ can always argue that it is nothing compared to the massive Three Gorges Dam which cost China US$ 59 billion and for which, during the 17 years it took to complete the project, 1.3 million people were relocated. What is frightening is that Beijing has now decided to ‘urbanize’ China. The priority for the new leaders is to shift people from the countryside to cities in order to sustain economic growth which last year ‘stagnated’ at 7.8 %, a 13-year low. Though many warned that China's urbanization can only fuel social unrest and more pollution, the government hopes that 60 % of China's 1.4 billion population will be urbanized by 2020. It is a ticking time-bomb as most of the recent violent clashes in China occurred over expropriation of farmland for development and pollution. Xi Jinping, the Chinese new President in his inaugural speech told his countrymen that he will put “arduous efforts for the continued realization of the great renaissance of the Chinese nation and the Chinese dream”. Xi also touched on corruption which he has called a threat to the party’s grip on power, and urged delegates to “oppose hedonism and flamboyant lifestyles”. As the adynaton says, ‘when pigs fly’, many things will happen. One can just hope that environmental issues will be tackled before the pigs start flying. What about India? For over 30 years I have heard that the Ganga and the Yamuna rivers will soon be clean. But the problem is not cleaning the rivers or the air, it is to stop polluting. As long as wealthy well-connected businessmen continue to pour their waste into the ‘sacred’ rivers of India, the question of cleaning them is pointless. Let us not wait for the cows to fly! AFTER 115 cardinals elected a new pontiff to St Peter’s throne, white smoke billowed from the chimney of the Sistine Chapel in Rome. The same morning, although a new Emperor had just been selected in the Middle Kingdom, nobody could see white smoke over the Great Hall of People. This was probably due to the heavy pollution in the Chinese capital, but Xi Jinping had succeeded Hu Jintao as China’s new ‘core’ leader. Paradoxically, the atheist Communist Party of China (CCP) is becoming more and more interested in spiritual matters. The CCP has started promoting reincarnated Lamas, known in China as ‘Living Buddhas’ in a big way. The Communist Government seems determined to fully play the ‘Panchen’ card against the Dalai Lama. 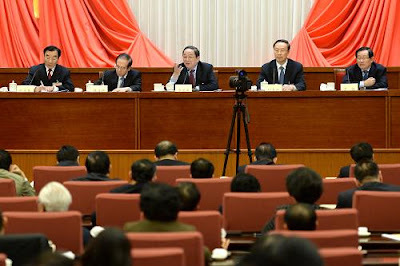 CPPCC’s members were to ‘elect’ their chairman, vice-chairpersons, secretary-general (Zhang Qingli, former hardliner party boss in Tibet got the post) and the Standing Committee members of the 12th CPPCC National Committee. While Yu Zhengsheng, a member of the Standing Committee of the Politburo was unanimously ‘elected’ chairman, 23 vice-chairpersons were also nominated, amongst them Pagbalha (or Pagphala) Geleg Namgyai, another Tibetan ‘Lama’. Born in 1942 in Litang in Kham Province, he was recognised at an early age as 11th Pagbalha Hutugtu (a Mongol title for a high incarnation). He collaborated with the Chinese from the start. In 1950-52, he was a member of Chamdo People’s Liberation Committee; in 1956-59, he became a member of preparatory committee for the Autonomous Region of Tibet. During the following years, he occupied many honorific posts in Beijing as well as in Lhasa. The old ‘spiritual’ puppet was a deputy to the second to the fifth National People’s Congress (NPC); vice-chairman of Standing Committee of the eighth and ninth NPC and vice-chairman of the third to the seventh CPPCC National Committee. 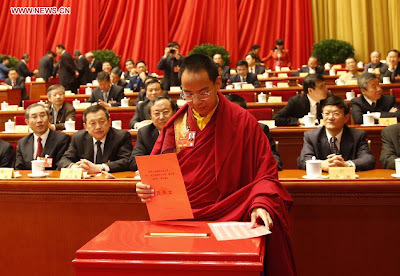 Though the Panchen Lama was not ‘double-promoted’ as vice-chairman, he made it to the Standing Committee, leaving Pagphala as the lone Tibetan as the CPPCC’s vice-chairman. Apart from Pagphala and the Panchen Lama, Dupkang Tupden Kedup, another ‘Living Buddha’ has also been elected to the Standing Committee of the CPPCC. He is presently vice-president of the Tibet branch of the Buddhist Association of China. Soon after his election, Kedup declared: “Earth-shaking changes have taken place in Tibet with the support from central government in recent years.” Kedup is ‘recognized’ by Beijing as the seventh Dupkang Rinpoche (reincarnated lama) from Nagchuka (or Nagqu), north of Lhasa. Let us not forget that there were several thousands rinpoches in pre-1950 Tibet; it is not difficult for Beijing to find a few spokespersons. Beijing seems to rely more and more on its own-appointed ‘Living Buddhas’. The fact that Tibet needed to be ‘incorporated’, shows that it was independent earlier. In January 2013, a 16-year old boy, recognized by the Communist Party as the 7th Reting Rinpoche was made the youngest member of Tibet’s CPPCC, even though the 5th Reting, a Regent in the 1930s and early 40s, was a controversial figure who nearly provoked a civil war in Lhasa. Beijing is trying its best to increase its control over reincarnations of Tibetan lamas (and ultimately the Dalai Lama’s), thus legitimising the Communist rule over the Himalayan region. China has even revived the title of Huthuktu, an ancient Mongol title given by the Manchus or the Mongols to Lama-rulers (in some cases to reincarnations of Regents). Reting, like Pagphala, has also been termed Huthuktu by Beijing. The truth of the matter is that the rule by reincarnation is not suited to a modern nation, mainly because it can too easily be manipulated. Take the example of the 10th Panchen Lama’s reincarnation. There are two contending candidates, one chosen by the Dalai Lama (Gedun Choeki Nyima, presently kept under confinement) and one selected by Beijing (Gyaltsen Norbu). Ditto for the Karmapa lineage ~ there are today three Karmapa candidates. But the atheist regime in Beijing seems today more attached to this flawed system of governance. One can only hope that President Xi Jinping will soon realise that the Communist Party is on the wrong track when it uses something it does not know, spirituality. New Tang Dynasty Television, the Falun Gong group TV channel reported that, during the last Chinese New Year, CCTV-9, the Chinese documentary channel broadcast a program based on declassified China-Russia historical files. Apparently one episode showed Mao’s famous 1957 speech in which he boasted that he had no fear of nuclear war nor how many of the world’s people would be killed, including in China. What is less known is that Mao said the same thing to Jawaharlal Nehru, the Indian Prime Minister when the latter visited China in October 1954. Mao then came to the second and main part of his argument which will remain in the history: his description of the atom bomb as a ‘paper tiger’. In olden days they used 'cold weapons' (i.e., knives, swords etc). Now hot weapons (rifles, guns etc.) are used. Cold ones kill less people and hot ones kill more people; atomic weapons will kill still more people. But besides increasing the rate of mortality they make no difference. In a third world war, many more people would be killed. ... it was so hard to accept, how willing Mao was to sacrifice his own citizens in order to achieve his goals. I had known as early as October 1954, from a meeting with India’s prime minister Jawaharlal Nehru, that Mao considered the atom bomb a “paper tiger” and that he was willing that China lose millions of people in order to emerge victorious against so-called imperialists. “the atom bomb is nothing to be afraid of,” Mao told Nehru. China has many people. They cannot be bombed out of existence. If someone else can drop an atomic bomb, I can too. The death of ten or twenty million people is nothing to be afraid of. Nehru had some strong reservations. First of all, for him, “even without war, India would have attained freedom.” He thought that in fact India would have been freed earlier without the war. Dr. Li added: “In 1957, in a speech in Moscow, Mao said he was willing to lose 300 millions people - half of China population. Even if China lost half its population, Mao said, the country would suffer no great loss. We could produce more people.”Nehru's second point was that though the US had won the war, they were still unhappy. He could therefore not accept Mao's argument; he had told him that though a war was bad and therefore should be avoided, still if it comes, one should welcomed it. Nehru believed that a third World War would be qualitatively different from the two earlier conflicts. Though the Americans thought that they could destroy the administrative, strategic and industrial centres of the USSR, in return, the Soviets would certainly not keep quiet. American centres would be destroyed and it would trigger an uncontrollable chain reaction. For Nehru, the hydrogen bomb releases energy which itself creates another energy which wants to kill; none would be able to control the chain of reaction. For the Indian Prime Minister, the industrialized countries would eventually be destroyed. Mao agreed that there was a disagreement between them on this point. He told Nehru that his analysis about the US having benefited [of Hiroshima] and still having difficulties [being unhappy] was very good. He also accepted his argument of the qualitatively difference in weapons, though “victory or defeat hinges on the scope of destruction suffered”. Dr. S. Gopal said that after his meetings with Mao, Nehru minuted in a small note on the file, that this record was not always accurate. Sometimes the Indian version (mainly his comments on the atom bomb) did not tally with what Mao said later. In any case, the 1957 version of Mao's speech tallies perfectly with what Dr. Li reported from that Mao-Nehru encounter in October 1954. During the Chinese New Year, the Chinese regime’s documentary channel, CCTV-9, ran a series on declassified China-Russia foreign affair files dating back to the Mao Zedong era. One episode showed Mao’s never-before-aired famous 1957 speech in which he boasted that he had no fear of nuclear war nor how many of the world’s people would be killed, including in China. Cheng Ming Magazine in Hong Kong reported that the negative impact of the documentary would likely have severely downgraded Mao’s image among Chinese viewers. With two episodes broadcast nightly for a week, the 18-episode documentary presented historical events previously unknown to the public, including the relationship between China and the former Soviet Union after 1949, and details of the Korean War, and the Taiwan Strait wars. It also revealed Mao’s relationship with Joseph Stalin and Nikita Khrushchev, his successor, exposing many instances of mutual scheming, betrayal, political blackmailing and extortion through witness testimonies from Rong Zhi, who worked at the Soviet Embassy in China, and Shi Zhe, the daughter of Mao’s early Russian interpreter. Chinese history experts on the Cold War, such as Shen Zhihua, Yang Kuisong, and Li Haiwen, provided the latest historical interpretations. Although this famous quote has been passed around among ordinary Chinese, there are still many who have refused to believe it. Some media pointed out that now the Communist Party’s television station has confirmed that Mao actually said it, that makes it an undeniable fact. Leftists and Maoists can no longer say that Mao and the Party put the wellbeing of people above all else, they said. My article No such thing as a ‘Chinese model’ appeared in niticentral.com. The South China Morning Post says that a senior PLA general warned his countrymen that corruption could ruin the PLA (and China). General Liu Yazhou, a political commissar at the National Defence University is however wrong when he refers to "the PLA's honesty and efficiency in their peak in Yanan, Shaanxi under the leadership of Mao Zedong in the 1940s, which helped them win public support and finally defeat the then-ruling Kuomintang to set up the communist regime in 1949." Dissidence and corruption was not something unknown in the early days of Communist China. It was already present at the end of the Long March when the great revolutionary leaders lead by Mao Zedong settled in the caves of Yanan. At that time, a writer, Wang Shiwei, published a very strong attack on the party leadership accusing the leaders of living a good life even as they preached asceticism and egalitarianism. Wang Shiwei (March 12, 1906-July 1, 1947) was a Chinese journalist and literary writer. He became famous for his contribution to the Chinese history of modern revolution and to Chinese modern literature. Wang joined the Communist Party of China in 1926, but later wrote critically of some aspects of the revolution. Under order from Mao Zedong, he was expelled from the party, and executed in 1947. From 1930 onwards he started to use other pen names, still pronounced "Shiwei" but using different characters. His novella Xiuxi (休息, meaning "rest"), talked about how young people should fight against the darkness of a country and was published in Xu Zhimo's "New Literary Collection" in 1930. His work outlined an "ideal society" where equality of opportunity was emphasized; he also incorporated some Marxist thought. 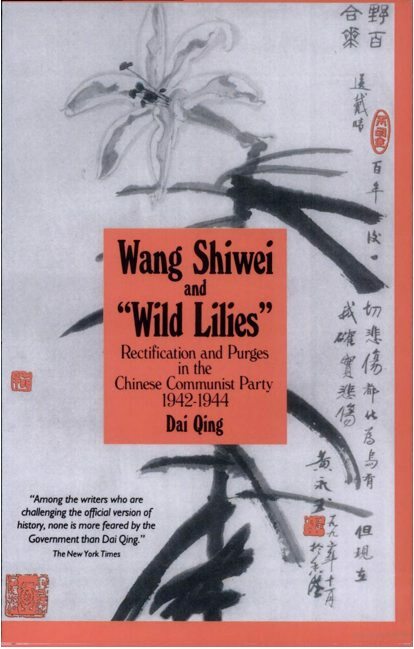 In his book Wild Lilies, Wang described the top leaders’ life: dancing at night while the common men had a very hard life struggling against the Japanese invaders. At that time, the party in Yanan, as later in Beijing, would not accept any dissident nor even being told of any wrong. By 1942, Wang was working for the Liberation Daily where he wrote the essay Wild Lilies criticizing Mao Zedong's taste for beautiful women, as well as what he called the unjustified privileges enjoyed by members of the Communist Party. It discussed the 'ugliness and indifference' of Yan'an; also criticizing some 'big men' in the CCP whom Wang thought were responsible for the 'growth of darkness' in China. The article caused him many woes. Mao's Talks at the Yan'an Forum in May laid down the official line, demanding that art serve politics. On 27 May 1942, the Central Committee held a seminar to discuss whether Wang was guilty. On 23 October, under the orders of Mao, Wang was expelled from the Communist Party on the charge that he was one of the 'Five Member Anti-Party Gang' of Trotskyites who were alleged to have sought to take over the Chinese Communist Party, and that he was disrupting party unity. Wang's defence was that he was not involved in any Trotskyist activities, except for helping his friends Wang Wenyuan and Chen Qingchen to translate two prose pieces in Autobiography of Leon Trotsky activities which he had already informed the Party of. Wang's 'trial', which took the form of a series of struggle sessions, ended in June 1942 with Wang being found guilty and put under arrest. Five years later, with Yan'an under Kuomintang attack and the Communists in retreat, Mao decided Wang should die. On July 1, 1947, on the direct orders of Mao which were confirmed by the Social Section of the Communist Party in Shanxi-Suiyuan, Wang was reportedly chopped to pieces and his remains were thrown down a dry well. At the end of the fifties, Mao began the campaign “Let the Hundred-Flowers Bloom, Let the Hundred Thoughts Flourish”. It was a treacherous way to get rid of all the dissidents at once. 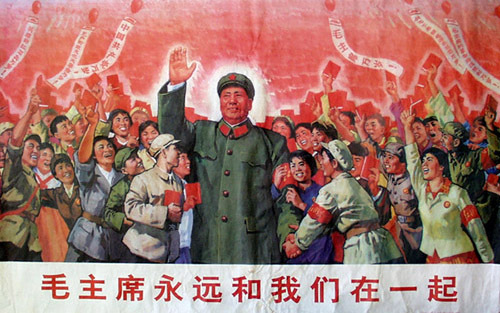 In asking the intellectuals to criticize the Party, Mao was able to ‘unmask’ tens of thousands of ‘intellectuals’. Once ‘unmasked’, they were ‘rectified’ during ‘anti-rightist’ campaigns. The new leadership in Beijing likes to speak about today's corruption, but nothing is new in the Middle Kingdom. Hopefully, the present leaders are less ruthless and more devoted to the masses. It is at least what one can hope. The combat effectiveness of the People's Liberation Army will be ruined if military leaders become obsessed with materialism, a hawkish PLA general warned. "Our country has a dream to be a strong nation, while the army also dreams to be a powerful force … It's an iron rule that valiant warriors come from highly disciplined troops," wrote General Liu Yazhou, a political commissar for the National Defence University, in a commentary on the party mouthpiece the People's Daily yesterday. "The most challenging thing to an army or a political party is how to keep vigilant in peace time, because corruption and enjoyment would erode our fine working style and revolutionary tradition," Liu wrote, referring to the PLA's honesty and efficiency in their peak in Yanan, Shaanxi under the leadership of Mao Zedong in the 1940s, which helped them win public support and finally defeat the then-ruling Kuomintang to set up the communist regime in 1949. "For a time … some individual leaders lost their minds and obsessed in a dissipated life, seeking personal profit and other corruption that brought great harm to our army," Liu wrote. Liu's criticism could be seen as an apparent reference to the disgraced Gu Junshan, a former deputy head of the army's General Logistics Department, who was taken into custody in January and put under investigation on suspicion of taking bribes. In his article, Liu also highlighted the importance of the anti-corruption drive launched within the army and party in November by President Xi Jinping, who is also party head and chairman of the PLA's top brass, the Central Military Commission. "Liu's article sends a strong signal to the army that it should continue its massive anti-graft drive, as it indicated that the CMC believed that even the army has lost its fighting spirit," said Ni Lexiong, director of the sea power and defence policy research institute at Shanghai University of Political Science and Law. "Xi has called the army to meet the goal of 'being prepared for real combat and for victory' because he wanted to use a big vision such as that to rebuild the PLA's morality and soul." He said that immoral spirits would not only ruin an army, but also cause a political regime to collapse. My article Farce in the name of Tibet’s representation appeared in the Edit page of The Pioneer yesterday. After 115 cardinals elected the new successor of St Peter in Rome, White Smoke billowed from the chimney of the Sistine Chapel. The same morning, from the Tienanmen Square, nobody could see the White Smoke over the Great Hall of People . It is probably due to the heavy pollution in the Chinese capital, a new Emperor had however just been elected: Xi Jinping succeeded to Hu Jintao as the 'core' leader of the Middle Kingdom. In the meantime, as I mentioned in an earlier post, the Communist Party of China is becoming more and more interested in 'spirituality'. The CCP has started promoting reincarnated Lamas, known in China as 'Living Buddha' in a big way. China Tibet Online published a photo of the 'Chinese' Panchen Lama, Gyaltsen Norbu (Bainqen Qoigyijabu in pinyin); it shows the young Lama voting: 'The 11th Panchen Lama fulfills his role as a CPPCC member'. It is clear that the Communist Government is now fully playing the 'Panchen' card against the Dalai Lama. The caption of the photo says: "The 11th Panchen Lama Bainqen Erdini Qoigyijabu, a member of the 12th National Committee of the Chinese People's Political Consultative Conference (CPPCC) casts the ballot at the fourth plenary meeting of the first session of the 12th CPPCC at the Great Hall of the People in Beijing, capital of China, March 11, 2013." CPPCC's members were supposed to 'elect' their chairman, vice-chairpersons, secretary-general (Zhang Qingli, former Party boss in Tibet got the job) and the Standing Committee members of the 12th CPPCC National Committee. Yu Zhengsheng, a member of the Standing Committee of the Politburo was eventually unanimously 'elected' chairman. During the same meeting, twenty three vice-chairpersons were also nominated , amongst them Du Qinglin (former United Front Minister), Ling Jihua (present United Front Director) and Pagbalha [or Pagpala] Geleg Namgyai, another Tibetan 'Lama'. Born in 1942 in Litang in Kham Province, Pagbala was early recognized as 11th Pagbalha Hutugtu (a Mongol title for a high incarnation). Phagpala collaborated with the Chinese from the start. In 1950-1952, he was a member of Chamdo People's Liberation Committee; in 1956-1959, he became a member of Standing Committee of Preparatory Committee of Tibet During the following years, he occupied many honorific posts in Beijing as well as in Lhasa. He was a deputy to 2nd to 5th National People's Congress (NPC); vice chairman of Standing Committee of 8th and 9th NPC and vice chairman of 3rd to 7th CPPCC National Committee. Coming back to the Chinese Panchen Lama, the Chinese press mentioned that "Panchen Lama takes higher advisory post"; it stated: "Three years after making his political debut, the 11th Panchen Lama, a spiritual leader of Tibetan Buddhism, has been entrusted with a more important role of advising China on state affairs. He was elected as a member of the Standing Committee of the CPPCC National Committee, China's top political advisory body." Xinhua added: "The elevation comes amid anticipation that the Panchen Lama, who turned 23 in February, will make greater political contributions through his religious influence." It quoted Rinchen Gya, the chairman of the Qinghai Province's CPPCC: "The 11th Panchen Lama's participation in politics will help build up reverence among Tibetan people." It is doubtful, though Xinhua commented: "The new post will increase the Panchen Lama's involvement in social and economic issues, as he will attend bimonthly meetings to discuss state affairs in the coming five years." Though the Panchen Lama was not elected as vice-chairman, he made it in the Standing Committee, leaving Pagpala as the lone Tibetan as CPPCC's vice-chairman. A Chinese website explained: "the CPPCC is a patriotic united front organization of the Chinese people, serving as a key mechanism for multi-party cooperation and political consultation under the leadership of the Communist Party of China and a major symbol of socialist democracy." It is not clear what this 'socialist democracy' is. Yu Zhengsheng in his inaugural address told the delegates that China will follow its own path and shun 'extremist' ideas of change based on foreign models (i.e democracy). Yu Zhengsheng advised to reject "impetuousness and extremist attitudes that lose contact with national conditions, we need to more strictly follow the socialist path of political development with Chinese characteristics. We will not copy models in Western political systems under any circumstances, always adhere to the correct political orientation, and strengthen the CPPCC's ideological and political foundations of collective struggle." Apart from Phagpala and the Panchen Lama, Dupkang Tupden Kedup, another 'Living Buddha' has also been elected in the Standing Committee of the CPPCC National Committee. He is presently vice president of the Tibet Branch of the Buddhist Association of China. Soon after the election, Kedup declared: "Earth-shaking changes have taken place in Tibet with the supports from central government in recent years,"
Kedup is considered by Beijing the 7th Dupkang Rinpoche from Nagchuka, north of Lhasa. Let us not forget that there were several thousands of 'rinpoches' in pre-1950 Tibet, it is not difficult for Beijing to find a few spokespersons. Kedup, like his CPPCC colleagues praised Beijing policy: "Since the Democratic Reform in Tibet in 1959, great changes occurred in Nagqu. In the past, there were no electricity and hospitals, except several tents. However, nowadays tall buildings, schools, hospitals, mobile phones and cars can be seen everywhere in Nagqu. I appreciate the CPPCC system for the advice from the CPPCC members are valuable and always had been attached great importance to by central government." Beijing seems to rely more and more on its 'Living Budddhas'. Dorje Phagmo, the only female reincarnation in Tibet is like the Panchen Lama a member of the CPPCC's Standing Committee. In 2008, she had declared that she was upset and angered by riots in Lhasa and accused the Dalai Lama of violating Buddhist teachings. She publicly stated that "since Tibet's incorporation into Communist China it had been transformed from the backwards feudal society of largely illiterate serfs with little medical care that she knew as a child. Old Tibet was dark and cruel, the serfs lived worse than horses and cattle." Born in 1942, at the age of five, she was chosen as the incarnation of the deity Vajravarahi and the abbess of Samling monastery . After the incidents of 2008, Dorje Phagmo told the Chinese press: "Watching on television a tiny number of unscrupulous people burning and smashing shops, schools and public property, brandishing knives and sticks to attack unfortunate passers-by I felt boundless surprise, deep heartache and indignant resentment... The sins of the Dalai Lama and his followers seriously violate the basic teachings and precepts of Buddhism and seriously damage traditional Tibetan Buddhism's normal order and good reputation." This was a few months before the Olympic Games. It seems that Beijing has decided to bring out its entire battery of 'Living Buddhas' to explain the tense situation on the Roof of the World; this, at the time the Dalai Lama is 'secularizing' the Tibetan society. Is it by bashing the Dalai Lama that the Tibetan issue will be resolved? Let us hope that President Xi Jinping will soon realize that China is on the wrong track. My post The Chinese who matter in Tibetan Affairs has been updated. I have added Wang Huning, a member of the Politiburo who 'represents' Tibet at the National People's Congress. Recently, he has often been seen with Xi Jinping; for example he accompanied him to Gansu (near the Labrang monastery) during the Spring Festival. According to the correspondent of the Ta Kung Pao, a Hong Kong newspaper regarded as the mouthpiece of Communist Party of China, Wang Huning, Chang Xiaobing and Ding Zhongli, the Han members of the Tibet Autonomous Region (TAR) delegation were present during Xi Jinping’s meet with the TAR delegation during the on-going National People's Congress. The Party General Secretary would have said the trio was members of the TAR delegation because they represented three faces of the vital Aid Tibet program (Central, economic and scientific aid). Xi also noted that a large number of senior officials who attended the Two Meetings in Beijing had been involved with different responsibilities in Tibet in the past. (It is said that 10 of the 25 members of the Politburo have been involved at one point or another of their career with Tibet). 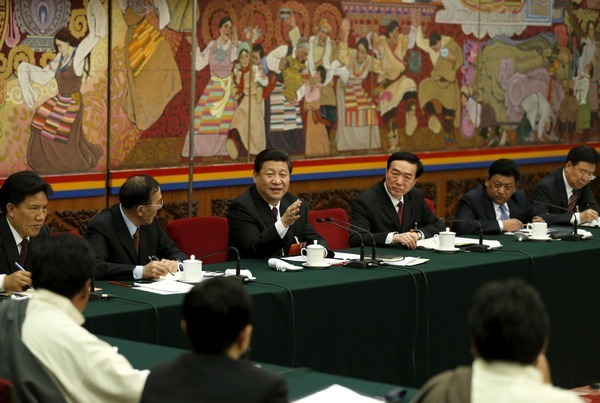 Xi apparently said the number of top officials involved in Tibet affairs will only increase in the future. He gave the assurance that Beijing will continue to pay close attention to the region. Xi pledged that his new leadership group would pay the same close attention to Tibet as previous leadership groups and would continue to emphasize “the maintenance of stability and leap-frog style development”, following China’s own special pathway and according to Tibet’s special characteristics. He cautioned however that there can be no stability in Tibet without economic development, but a constant vigilance must be exercised against ethnic problems, sensitive religious issues and sudden waves of Tibet independence sentiment . Xi said China will not bend to the pressure produced by collusion between foreign hostile forces and those seeking Tibet independence. Xi said the special characteristics of Tibet must be respected with even greater protection to its culture and religious faith as well as continuous support for its rapid, leap-frog economic development. There is no other independent source to corroborate the Ta Kung Pao's assertions. Also regarding Tibet, the South China Morning Post mentioned that: "The former top aide to outgoing President Hu Jintao scraped through to vice-chairmanship of the nation's top political advisory body (CPPCC) yesterday with the lowest number of votes, after his career was hit by a scandal over the cover-up of his son's death in a Ferrari crash in Beijing last March." I have mentioned a few times on this blog the role of Ling Jihua, the new boss of the United Front Department dealing amongst others with Tibet affairs. Ling Jihua, Hu Jintao's former Chief of Staff, made it to vice-chairman with 90 of the 2,191 delegates voting against him, the highest number of opposition votes recorded. The Hong Kong newspaper said the Ling showed no emotion after the result was announced. Though the vice-chairmanship of the CPPCC is largely symbolic, those holding the office are regarded as 'state leaders' and entitled to a range of perks. The South China Morning Post had reported on October 2012. High-level Communist Party official Ling Jihua lost his son in the accident. 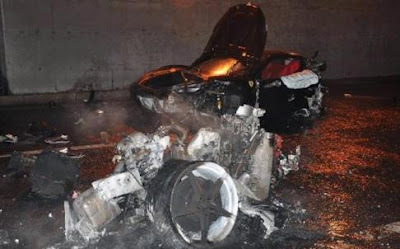 The magazine, citing 'informed Beijing sources', claims both the women are ethnic Tibetans and were each 25 years old at the time of the accident. The least one can say is a solution for the Tibetan issue is not on the horizon, though Xi's rule may be more benign than Hu Jintao's. Nepal invaded by China, for India's good? The Chinese are slowly invading Nepal. A Nepali anaylsyt told AFP "In Tibet, unrest has significantly increased, so Chinese investment in Nepal should be understood in the context of China's integrity, which is very important for the giant nation." He added: "Some Indian analysts repeatedly warn that China has built these ports to prepare for a war with India, it will definitely provide China with an edge but at heart, its goal is to expand the economic opportunity to its workforce and make them loyal to the state." From Mao's time, the Chinese have always spoken of dual use for infrastructure. In Tibet's Nyingchi prefecture for example, infrastructure has tremendously been developed, with the first objective to accommodate more than 1 million tourists every year. But the same infrastructure can be used in case of conflict with India (Nyingchi is just north of the McMahon Line). Ditto in Nepal which is fast invaded by China. In this context, it is interesting to mention an article published by The Hindustan Times on November 11, 1950. The title is "Sardar Patel Exhorts people to stand unitedly to see conditions in Tibet and Nepal and defend their country". The article quotes Patel in one of his last speech (probably the last in Delhi). His conclusion was "In this kalyug we shall return ahimsa for ahimsa. But if anybody resorted to force against us we shall meet it with force." message of both Swami Dayanand and Mahatma Gandhi. "Do not let cowardice cripple you. Do not run away from danger. The three-year-old freedom of the country has to be fully protected. India today is surrounded by all sorts of dangers and it is for the people today to remember the teachings of the two great saints and face fearlessly all dangers." The Deputy Prime Minister continuing declared: "In this kalyug we shall return ahimsa for ahimsa. But if anybody resorted to force against us we shall meet it with force." The Chinese continue to advance. But now, they say that they want to do business with India. KATHMANDU — China's ambassador to Kathmandu was recently pictured in a traditional Nepali cap and silk scarf, digging with a spade to symbolise the laying of the foundations of a new dry port near the Tibet border. The photo opportunity marked the latest in a series of major projects that underscore China's growing economic influence in Nepal, where it is building roads and investing billions of dollars in hydropower and telecommunications. Other Chinese projects in its impoverished, electricity-starved Himalayan neighbour include a $1.6 billion hydropower plant which is expected finally to end power outages which extend to 14 hours a day in winter. Meanwhile China recently completed a 22-kilometre (14-mile) stretch of road in central Nepal connecting the country's southern plains with the Tibetan county of Kyirong, to form the shortest motorable overland route between China and India. Analysts have questioned whether Beijing's largesse is a gesture to a neighbour in need, or the result of a foreign policy which increasingly sees Nepal's roads and dry ports as a doorway to the huge markets of India. "I am sure that these infrastructure projects will help win influence in Nepal but they will serve a dual purpose," said Purna Basnet, a Nepalese political commentator who frequently writes on Chinese influence in Nepal. "It will be easier for China to supply goods to India via Nepal. There is even a talk of connecting Kathmandu with their rail networks in Tibet. 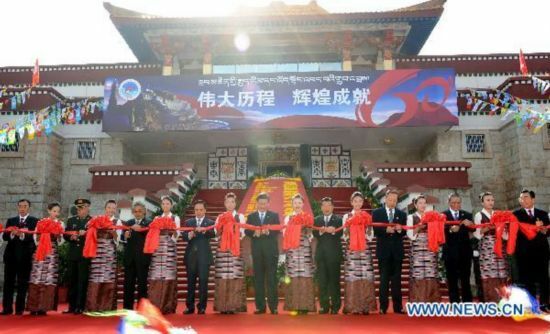 "The Shigatse-Lhasa railway will be completed in a couple of years. From Shigatse, they have plans to connect Kathmandu through railways." Nepal has always been in the shadow of its southern neighbour India, which has traditionally exerted huge political influence and is Kathmandu's biggest trading partner and sole provider of fuel. Since the end of a bloody decade-long civil war in 2006 and the emergence of the Maoist rebels who fought the state as the largest political party, China has been gradually -- and literally -- making inroads as a counterweight to India. Chinese ambassador Yang Houlan outlined his country's vision of Kathmandu as a trade gateway to New Delhi in a recent op-ed article in Nepal's English-language Republica newspaper. "From an economic viewpoint, Nepal links China (with 1.3 billion people) with South Asia (with 1.5 billion). The huge common market provides great opportunities for both China and South Asia," he wrote. "China is pushing its ?Develop West' strategy, and South Asia represents one of the main overseas investment opportunities. Nepal could provide China the much-needed overland channel to South Asia." China's commitment to Nepal is outlined by its construction of a further five dry ports in the Himalayan region where the treacherous terrain marks the 1,414-kilometre long border. It has also offered to fund an international airport in the tourist hub of Pokhara. On top of infrastructure development, around two dozen Chinese companies have invested $100 million in housing, hotels, restaurants and other areas of tourism in Nepal. By the end of 2013 annual trade between the two countries is expected to hit $1.5 billion, a 25-percent rise on an annual basis. But it's not just about getting rich, say many observers who see China's investment in Nepal as a vital part of its strategy for quelling unrest in a country of 55 ethnic groups where poverty remains a major threat to security. "In Tibet, unrest has significantly increased, so Chinese investment in Nepal should be understood in the context of China's integrity, which is very important for the giant nation," said Kathmandu-based strategic affairs analyst Lekhnath Paudel. "Some Indian analysts repeatedly warn that China has built these ports to prepare for a war with India," he added. "It will definitely provide China with an edge but at heart, its goal is to expand the economic opportunity to its workforce and make them loyal to the state." Soon-to-be president of China, Xi Jinping made it a point to meet the 'Tibetan' delegates at the National People's Congress (NPC) in Beijing. These delegates are not known political figures in Tibet; they must have just been picked up for the circumstances. Xi Jinping, general secretary of the Central Committee of the Communist Party of China (CPC), receives a hada [khata], a white silk scarf symbolizing respect and blessing, from a deputy [Lobsang Tempa] to the 12th from southwest China's Tibet Autonomous Region, in Beijing, capital of China, March 9, 2013. 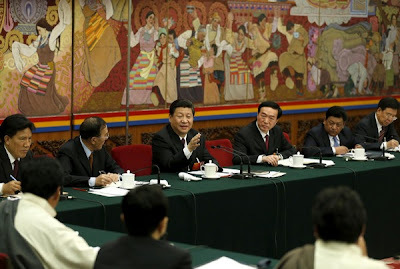 Xi joined a discussion with the Tibet delegation attending the first session of the 12th NPC in Beijing on Saturday. Amusingly, China speaks of the Chinese Model of governance. Eric Li, Shanghai venture capitalist and a 'political scientist' wrote in Foreign Affairs an article praising the supreme meritocracy prevalent in the Middle Kingdom. He said: "A person with Barack Obama's pre-presidential professional experience would not even be the manager of a small county in China's system," adding that Xi Jinping: "By the time he made it to the top, Xi had already managed areas with total populations of over 150 million and combined GDPs of more than US$1.5 trillion." Li believes: "China will continue to rise, not fade. The country's leaders will consolidate the one party model and, in the process, challenge the West's conventional wisdom about political development and the inevitable march towards electoral democracy. In the capital of the Middle Kingdom, the world might witness the birth of a post-democratic future". I would like to know what are the 'merits' and 'experience' of these Tibetan delegates. The answer may puncture the so-called Chinese Model of governance. By the way, an agency report mentioned that: "China's single legislative, the National People's Congress (NPC), is almost the wealthiest in the world with 83 billionaires counted among its delegates, according to a report. The China-based Hurun Global Rich List has identified 31 people having more than one billion dollars in personal assets, among the listed billionaire delegates to the Parliament. According to the list, the richest is Zong Qinghou, who is the founder of Chinese drinks maker Wahaha, with an estimated fortune of $13 billion. The Hurun list identifies the remaining 52 billionaires as delegates to the Chinese People's Political Consultative Conference (CPPCC), an advisory body. According to the list, the average fortune among the 83 billionaire delegates is 3.35 billion dollars, which contrasts heavily with the average annual wage of less than 7,000 dollars for Chinese urban workers. The number of dollar billionaires identified by the list was up 17 percent this year." This is again called the Chinese Model. BEIJING, March 9 (Xinhua) -- Xi Jinping, general secretary of the Communist Party of China (CPC) Central Committee, on Saturday expressed his best wishes to Tibetans after receiving a three-meter-long thank-you letter from 108 Tibetan lamas. "Please convey my best wishes to all. 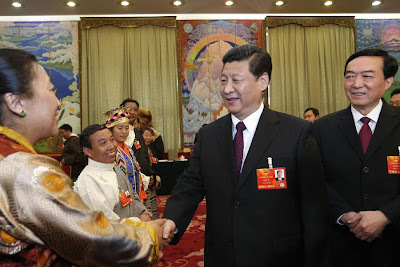 Tashi delek (a Tibetan greeting for good luck and best wishes)," Xi said while attending a panel discussion of the Tibetan delegation to the first session of the 12th National People's Congress (NPC). 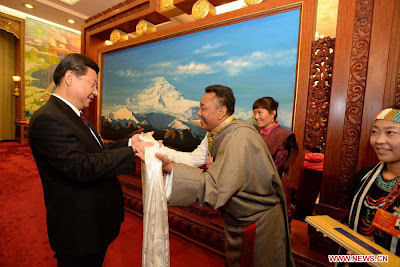 NPC deputy Losang Tenpa presented to Xi a hada, a strip of raw silk and linen for good blessing, as well as the hand-written thank-you letter from the 108 high monks of Tibetan Buddhism. "The high monks in Tibet are grateful to the CPC for its religious policies, so they wrote the letter that I'm presenting to you," Losang Tenpa said. Xi Jinping general secretary of the Central Committee of the Communist Party of China (CPC), talks with a deputy to the 12th National People's Congress (NPC) from southwest China's Tibet Autonomous Region, in Beijing, capital of China, March 9, 2013. The rule by incarnation outdated?